Heirloom Michigan Apples for sale. Buy online at Zingerman's Mail Order. Gourmet Gifts. Food Gifts. Back after a one year hiatus! Regular fans will recognize the return of Peter Klein's tree ripened apples. It's been two years since they've been available (last year's harvest was decimated by a late spring frost) so we're especially excited to see them again. What makes these so memorable isn't just the variety included (at least four heirloom varieties) but the intensity and complex flavor of each bite. Using a bit of science to discern when a fruit is at the peak of its flavor, Peter leaves the fruit on the tree till it's perfect instead of yanking it off when it "looks good enough." What you get is one of the crispiest, sweetest apples you've had since you were a kid. Actually, it makes a great gift for kids, especially ones at college. One caveat that might be important if you're giving this as a gift. Heirloom-breed apples aren't always the most handsome. They're charming and they taste great, but they may be a bit small, a bit brown. They're bred for flavor, not looks. They don't look like the shiny, waxy genetic marvels at the supermarket. 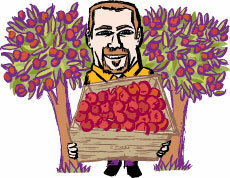 A box of twenty apples (a peck) is shipped directly from the orchard to you. Stored chilled, they'll last two weeks. Quantities limited. Not available for pickup. Arrival time is three to ten days from the day you submit your order.